Once the thermal cycle is complete, the plates containing PCR reactions can be read using a fluorescent plate reader. In our SNPline workflow we use and recommend use of the BMG Omega F or PHERAstar plate readers. The Omega F can be used for 96- and 384-well PCR plates only. The PHERAstar can also be used to read 96- and 384-well plates, but it has the necessary resolution and sensitivity to read 1536-well PCR plates, and is used all the time in our service laboratories for this purpose. For high throughput work, both instruments have automated stacker options and can be integrated with third party stackers. As with other components in the SNPline workflow, customers with existing readers that read at the correct wavelengths for KASP and with the required level of sensitivity can choose to use their own reader instead. Our technical team can help you to determine if an existing reader(s) will be suitable for this purpose. The plate reader that we recommend for the SNPline Lite workflow is the BMG FLUOstar Omega. This reader works exceptionally well for KASP™ genotyping reactions run in 96- and / or 384-well PCR plates and, if you are not planning on running reactions in 1536-well plates, it represents a very cost-effective alternative to the PHERAstar reader. When purchased through LGC, the FLUOstar Omega comes with a deeply-discounted single-computer license for our KlusterCaller™ software for analysis of genotyping data. An adaptor to work with semi-skirted and / or unskirted 96-well PCR plates is also available. The plate reader that we recommend for the SNPLine XL workflow is the BMG Pherastar, primarily because it has the sensitivity to read fluorescent signal from 1 µL reactions in 1536-well plates and can be run via our Kraken™ software. We have worked in conjunction with BMG to ensure the instrument performs exceptionally well with our KASP genotyping chemistry. The PHERAstar uses a single excitation dual emission technology, which means it can read both the FAM and ROX signals in a single pass, and then the HEX and ROX signals in the second pass. This translates into a 30% faster read time and means that a 1536-well plate is read in just over 1 minute. 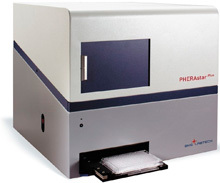 When purchased through LGC, the PHERAstar comes with a deeply-discounted single-computer license for our KlusterCaller software for analysis of genotyping data. Options include the BMG- designed microplate stacker with barcode reader for automated loading and unloading of plates (~40 plate capacity), along with adaptors for 384- / 1536-well PCR plates, and semi-skirted and / or unskirted 96-well PCR plates. *Only available with SNPline. Optional KlusterCaller software available for all three models. PHERAstar typically uses optional Kracken software.